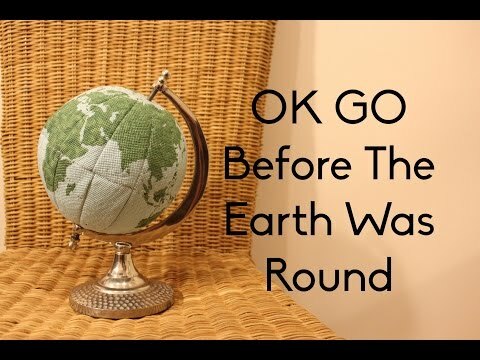 I've spent the past 7 months creating a time-lapse video for Before the Earth Was Round and I thought you'd be the perfect people to share it with! This was my first attempt at a 3D cross stitch. I sketched the globe pattern onto cloth with a pencil before hand stitching everything (which took 1200+ hours). Then I sewed all of the pleats and sections together to create a globe and stuffed it with confetti (no, not confetti, cotton. Although, confetti would have been more fun!). I wrote the lyrics to the song with leftover thread as I took each progress photo, over 700 photos in all. I hope you love it as much as I do. Again,I love the project it's awesome. Your globe is so detailed, and not that large, it looks like - those stitches must be tiny! I like the thread spelling out the words, and the time it sort of unravels instead of just being replaced by the next image. You must have planned this out fairly carefully, to have timed the video and everything. Congratulations on finishing it. What will you do with the globe? Will you keep it? Your video reminds me I ought to look again at the liner notes for OTBCOTS. Yes, the stitches are minuscule! This was not planned out as carefully as it appears to be and there are definitely spots where mistakes were made but looking at the video as a whole, I think the little mistakes make it more interesting. Right now the earth is on display in a stand from a globe (I just took the globe off and replaced it with my own). I will probably end up keeping it, I think this is probably the most epic piece I'll ever do! I agree - little mistakes can often make a piece of art - or an interview, or whatever - more interesting, I think because they make it more human and real.